Offering you a complete choice of products which include material handling conveyors and material handling equipment. Material Handling Conveyor leverage on our sound reputation as trusted manufacturers, suppliers, and exporters. 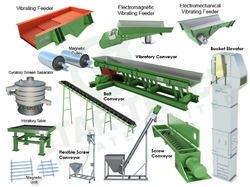 We present Belt Conveyors that are widely used in mining, coal, and other industries. We cater to varied requirements of our clients by presenting these in different designs. 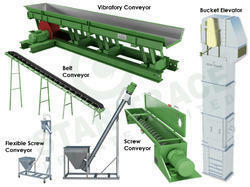 Our screw conveyors come in various types according to material to be handled. Our patrons can avail premium assortment of lifting magnets for lifting and separating ferrous materials. As Material Handling Equipment manufacturer, supplier and exporter design for optimum efficiency and precision engineering. Our belt conveyors are used extensively in mining, coal, and allied industries. These are offered in different specifications and designs to cater to varied requirements of our clients. We offer screw conveyors in different types to suit various kinds of materials that are handled including cement, sugar, salt, sand, and so forth. We offer supreme gamut of lifting magnets for lifting and separating ferrous materials. These are offered at leading industry prices.